Would you like some Free Ice Cream? “It’s sustainable and rich in protein”. The flavors are Choc Hopper, Strawberries & Swirls, Scurry Berry, and Nutritious Neapolitan. So, what’s the catch? The ‘catch’ are grasshoppers, meal-worms and critters! During the summer of 2015, The Economist cycled around the streets of London giving away ‘insect’ ice cream as part of a campaign to engage readers with a recent and rather controversial publication featuring ‘why eating insects makes sense’ (Greenslade, 2018). I recently made a poll on Instagram to see how many people would try the insect ice-cream. Surprisingly, 40% said yes! However, if you align with the 60% remaining – keep on reading! 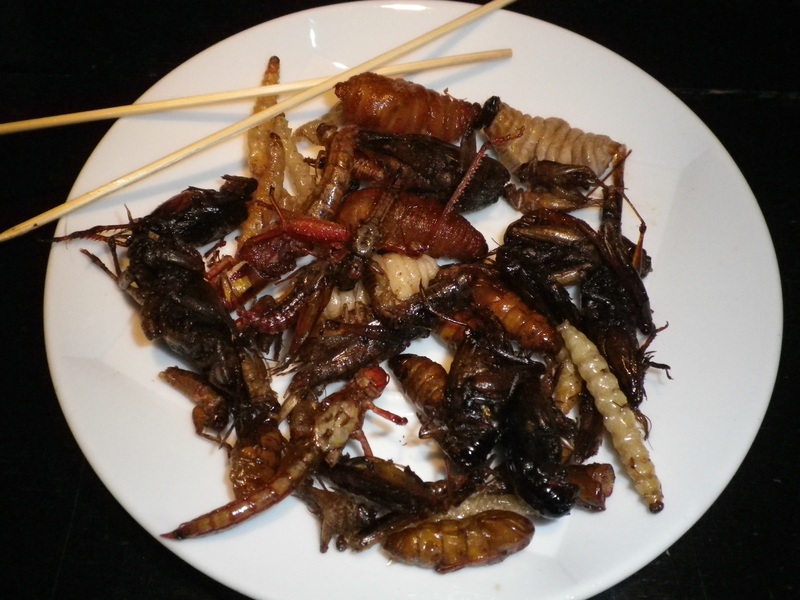 “Insects” are becoming the leading candidate for the future population’s diet. There is even a fancy name for it ‘Entomophagy’. The Food and Drug Administration (FDA) and United Nations have proposed insects are the solution to meeting the needs of the population growth. The reasons behind this, include that insects have a high food conversion rate (they don’t eat much), they are significantly better for the environment compared to livestock, and they contain a high nutritional value. In addition, there are various socio-economic benefits to be considered from breeding and eating insects. By 2050, the population is estimated to reach 9 billion people. This means we will need twice the amount of food we produce today (United Nations, 2018). Unfortunately, our current diet is not sustainable with growing population trends. The demand for protein consumption is increasing but the amount of land to rear livestock is limited. In foresight, the United Nations has released a 185-page document promoting the consumption of edible insects both for humans and cattle. According to the UN, “Insects have a high food conversion rate, e.g. crickets need six times less feed than cattle, four times less than sheep, and twice less than pigs and broiler chickens to produce the same amount of protein.” (“Edible insects”, 2013). In other words, insect production is “green”- they consume little food and produce a lot (Cassimally, 2013). In a follow-up article, The Economist graphed the ratio between the amount of food an insect will consume to how much food they will produce. “A cow takes 8 kg of feed to produce 1 kg of beef, but only 40% of the cow can be eaten. Crickets require just 1.7 kg of food to produce 1 kg of meat, and 80% is considered edible.” (“Grub’s up”, 2013). In addition to this, breeding insects is more environmentally friendly than livestock because insects emit significantly fewer greenhouse gasses and ammonia. A study by the University of Wageningen found that per kilogram, pigs produce between 10 and 100 times more greenhouse gases than mealworms, and 50 times more ammonia than locusts (“Edible insects produce smaller quantities of greenhouse gasses than cattle”, 2011). In addition, insect harvesting causes farmers to reduce the use of pesticides in crops (Cerritos, 2009). From a nutritional perspective, studies suggest that consuming crickets, larvae, and mealworm is significantly healthier than beef or chicken. Not only are they rich in unsaturated fatty acids, but also have a high content of vitamins, minerals, and fibre (Rumpold. & Schuter., 2013). As for protein, research has found insects are superior to many plant proteins and come very close to the contents of egg and beef (Finke, 2012). In fact, some companies such as “Heilufood” already have products such as protein powders, bars, crisps and pasta on the market (Hoyos & Hoyos, 2018). ‘One Hop Kitchen’ have even released a Bolognese sauce made from insect protein. In addition to the environmental and nutritional benefits of eating insects, there is also the opportunity for socio-economic benefits. Insect rearing can be performed by the poorest members of society as it does not require sophisticated machinery. Therefore, as the demand for insect consumption grows, it could present great socio-economic benefits (Cassimally, 2013). The question remains, how do you feel about trying that Choc Hopper now that you have read about Entomophagy’s many benefits? If the answer is still very much “no, thank you – where are my chicken nuggets?”, let me ask you another question: have you ever had a Strawberries & Cream Frappuccino at Starbucks? Or one of their Mini Donuts with the pink icing? If so, you may have to reconsider; until 2012 Starbucks used a red dye extracted from the cochineal beetle to color their goodies (Shreeves, 2012). In addition; according to the FDA, processed foods are legally allowed to contain “a certain amount of bug parts”. For example, up to 20 maggots are allowed per 100 grams of mushrooms, up to 60 mites per 100 grams of broccoli, and up to 13 insect heads in ever 100 grams of fig paste. But the winner for the highest allowance of bug parts goes to oregano, with an impressive 1,250 bug parts per 10-gram sample! (“Defect Levels Handbook”, 2018). Factors such as the FDA bug part allowance has led to the estimate that the average western person consumes between one and two pounds of bugs per year! In other words, we already eat insects; we simply aren’t aware of it. I must agree that watching Bear Grylls’s drink cricket smoothies for breakfast gives me the shivers. However, the reasons for not eating insects are mainly cultural and have little to do with actual taste. For 30% of the population, insects contribute to a fundamental proportion of the daily diet. 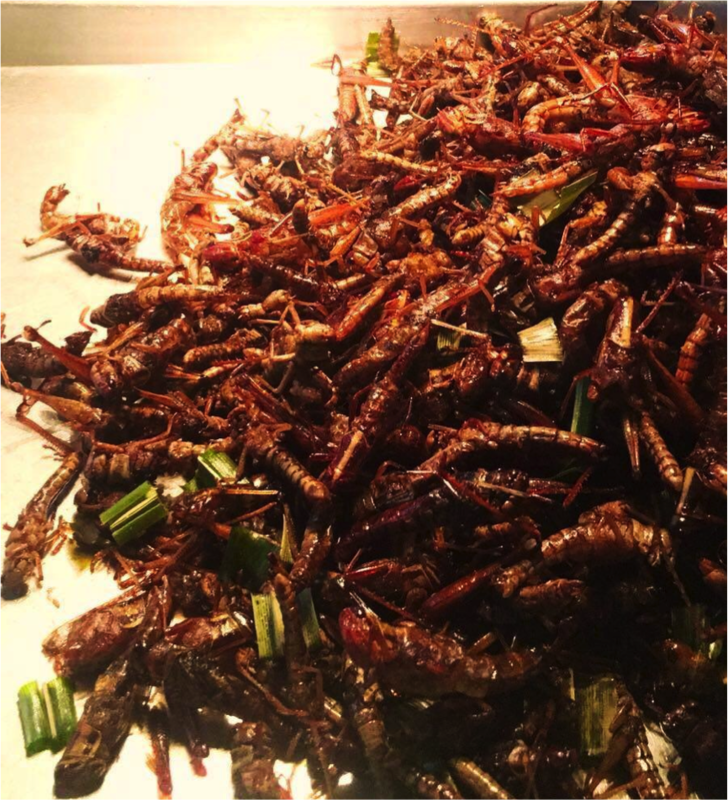 In Thailand, the import of insects for food is 1.14 million USD/year which is significantly higher than the market value for beef, pork, chicken or rice (Hanboonsong et al. 2013). Mexican’s even have a Marmite equivalent known as ‘salsa de Chicatanas’. The popular spread is prepared by grinding tomatoes, garlic and chili with Chicatanas (giant winged ants) (Planet, 2018). But if you still haven’t warmed to the idea of eating insects, I suggest that you start stocking up on baked beans. Between 2018 and 2023, the global market value of edible insects is expected to grow from about 406 million U.S. dollars to over 1.18 billion (Facts, 2018). And following the current trend in population growth, sooner or later you are going to have to get used to it.